Kelley Paul, the wife of Sen. Rand Paul of Kentucky, wrote in a CNN op-ed that the media had victimized her husband a second time after he was attacked earlier in November. 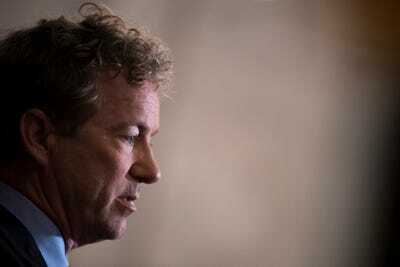 Rand Paul has six broken ribs and lung damage as a result of the attack; police have charged his neighbour with assault. Media outlets have frequently quoted the Pauls’ neighbours as saying Rand Paul was in a landscaping dispute with his neighbour – a narrative Kelley Paul rejected. The wife of Sen. Rand Paul lambasted the media on Wednesday for “delighting” in spreading rumours about the attack earlier this month that left the Kentucky Republican with six broken ribs and lung damage. “This has been a terrible experience; made worse by the media’s gleeful attempts to blame Rand for it, ridiculing him for everything from mowing his own lawn to composting,” she wrote. Kelley Paul added that her husband had not taken a single breath without pain since the incident on November 3. Kelley Paul appeared to be referring to Jim Skaggs, who developed the gated community in which the Pauls live. Skaggs did not witness the attack but has opined on it to various media outlets, saying Rand Paul and his neighbour had a long-running dispute about the landscaping on their properties. “The only ‘dispute’ existed solely in the attacker’s troubled mind, until, on a beautiful autumn day, he ran down the hill on our property and slammed his body into Rand’s lower back as he stood facing away, wearing noise-cancelling headphones to protect his ears from the lawnmower,” she wrote. Police have charged Rene Boucher, a 59-year-old retired anesthesiologist, with fourth-degree assault. In a bizarre statement released shortly after the extent of Paul’s injuries were made public, Boucher’s attorney, Matthew Baker, said the incident had nothing to do with either man’s political beliefs. Boucher, who has pleaded not guilty, is due in court on November 30.